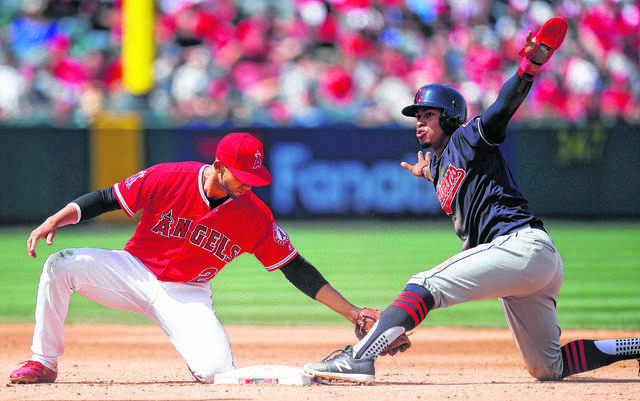 Francisco Lindor, of the Cleveland Indians, right, gestures after stealing second base against Los Angeles Angels’ Andrelton Simmons during a game last season. The Indians are favored to win the American League Central Division again this season. The last few weeks have been rather quiet for the Indians as baseball’s hot stove has frozen over not too much unlike those in the Midwest who shivered through a polar vortex. But for the Indians, a team securely within its contention window and with multiple holes to fill around the roster, silence can be the enemy (though, making some noise just for the sake of being loud isn’t ideal, either). Here’s the state of the Indians just a few weeks before pitchers and catchers report. President of baseball operations Chris Antonetti and general manager Mike Chernoff made their primary objective clear back in December, one upon which they’ve acted multiple times. The front office has been fighting a battle on multiple fronts all winter. They needed to reallocate their resources to not only shed some payroll but also align some of those chess pieces to put themselves in a better position beyond 2019. The trades that sent Yan Gomes to Washington, Edwin Encarnacion to Seattle (the three-team deal that netted Carlos Santana and Jake Bauers and also shipped away Yandy Diaz to Tampa Bay) and Yonder Alonso to the Chicago White Sox hasn’t made the 2019 edition of the Indians a better team on paper. But what it did was limit the immediate impact while freeing up some financial flexibility. The Indians have been able to rework their roster and shift around their available resources to alleviate some of the pressures that an increasingly expensive roster was creating. It also lessened the sheer need to deal Corey Kluber or Trevor Bauer, at least for financial reasons. But it has been more difficult than usual to really assess what these deals mean or their effectiveness because there was a significant qualifier attached to all of them: it was dependent on what the Indians did with those newfound resources. It all came down to the next move. The outfield is a bit of a mess and the bullpen needed to be upgraded. To date, much of it hasn’t been reallocated into the roster aside from Oliver Perez’s return. Which leads much of the questioning to the Dolan ownership’s spending habits, something that requires a deeper look to consider all of the needed context from the past few years. The Indians have been on a steep incline in terms of spending since the 2016 trade deadline. But what was their starting point prior to that? When evaluating a team in terms of their financial commitments, a key measurement is the rate at which that club is converting revenue into player payroll. That’s taking into account how much money is coming in and how much money is being dedicated to the roster. According to Forbes’ annual MLB organizational evaluations, one team had nearly the identical revenue-to-payroll rate as the Indians in the spring of 2015: the mighty New York Yankees. The Yankees of course were earning and spending at much higher figures, but the conversion rate made these two clubs their closest counterparts. That was before the Indians began spending money at a higher rate than they ever had previously in their history. The Indians dealt for Andrew Miller, handed out the largest free-agent deal in club history to Encarnacion and signed others to smaller deals, including Boone Logan, Alonso and a few more. All of it, combined with the internal long-term deals to several key pieces around the roster, boosted the club’s payroll to new summits. But eventually, flying at that financial altitude forces most teams to come back down for some oxygen. The Indians are experiencing that now, and it’s been one of the key driving forces this winter. The Indians did save a little more than $30 million due to the free-agent absences of Andrew Miller, Michael Brantley and Cody Allen, all of whom found new homes elsewhere. That also doesn’t include Lonnie Chisenhall and a slew of others. But much of those savings were erased due to built-in salary increases to several players (Kluber, Carlos Carrasco, Jose Ramirez, Jason Kipnis and several others) and expected arbitration increases, namely to Francisco Lindor and Bauer. Those regained funds from Miller, Brantley and Allen can more-so be looked at as revenue before expenses rather than sheer profits to be poured back into the company. It was needed collateral and already accounted for. The profits arrived via the three major deals the Indians made this winter, which combined netted more than $20 million heading into the 2019 season. Antonetti said in December the Indians weren’t working with a particular number in terms of their payroll ceiling. Thus, it didn’t necessarily mean the Indians would convert that extra financial flexibility into the free-agent market, nor did it mean that was their spending ceiling. But so far, Perez and his $2.5 million deal for 2019 is almost all they have to show for it. Paul Dolan and the Indians’ front office likely hasn’t received the deserved credit for the team’s spending habits since the summer of 2016, when it became clear they could have a winner. They—including Antonetti and Chernoff—made the aggressive trade to deal prospects in an effort to win now (Miller). They spent the big bucks on the “right-handed power bat” for which fans had been clamoring for years (Encarnacion). They locked up more of their young stars to long-term deals (Ramirez). They set franchise payroll records. That financial well seems to have dried up this winter, though. And while those spending habits might have been unsustainable for too long, it isn’t the right timing. It also doesn’t mean the needed move isn’t coming—it just might be have to wait. Contention windows in Major League Baseball are cyclical, especially for a team with a market size like the Indians. Those windows can be kept open, and some can stave off a sudden fall longer than others, but eventually teams are going to hit that financial barrier and need to rebuild. It seems Antonetti and Chernoff, who have proven their abilities in building a World Series contender without the benefits of a large market, have this winter been hamstrung in terms of resources with which to build the roster and must now wait for the trade deadline to see if the right opportunity arises. The current outfield situation leaves a lot to desired, to put it nicely. There are plenty of internal options, but there will also be a good deal and praying for angels to appear in the outfield as a saving grace rather than being able to count on the contributions and track record of someone like, say, Brantley. Or, perhaps, Nick Markakis, who signed a modest $6 million deal to stay in Atlanta, among many others as examples. Yes, Kluber, Carrasco, Lindor, Ramirez, Bauer, Kipnis, Roberto Perez and others are becoming more expensive each year, thus putting an additional strain on the payroll. Yes, spending at that rate forever was never going to happen. The Indians identified their chance over a few years to win a World Series, and they hit the gas, tossing prospects and money at their issues. It seems more likely than not that, at this point, a major signing or trade isn’t on the immediate horizon. Pitchers and catchers report to Arizona in less than two weeks—a significant shakeup isn’t likely by then. But, it also doesn’t mean the Indians can’t put a charge into their postseason chances prior to October after seeing what their internal options can offer. The Indians in recent years added Miller, Jay Bruce, Brad Hand and others in July or August. That could be the case again if Antonetti and Chernoff didn’t want to go too deep into free-agent waters with the now limited resources they had available. The trade market might bring the more secure return, but it’ll also be more costly in the way of prospects. Last year’s deal for Hand saw top prospect Francisco Mejia head to San Diego, for example. But that might also be the only door available to them. Here’s what we know about this Indians team heading into spring training. It features one of the best rotations in baseball with multiple American League Cy Young contenders. It features two bonafide stars and AL MVP candidates in the infield. It features an All-Star closer. It also features the weakest projected outfield of any contender. The bottom of the lineup is less imposing on paper than it has been in several years. The bullpen’s depth has been slashed. It’s top heavy, and a key injury here or there could lead to disaster. The Indians remain the clear favorites in a weak and rebuilding AL Central. FanGraphs currently has the Indians projected for 93 wins, tied for the fourth-best win total in baseball. The Twins are projected for 83 wins as the lone team expected to present any sort of a challenge to the Indians in 2019.
https://www.limaohio.com/wp-content/uploads/sites/54/2019/02/web1_Tribe.jpgFrancisco Lindor, of the Cleveland Indians, right, gestures after stealing second base against Los Angeles Angels’ Andrelton Simmons during a game last season. The Indians are favored to win the American League Central Division again this season.